Eyvonne Sharp is a Network Architect and co-founder of Network Collective. She has over two decades of experience in enterprise networking, currently based out of Louisville, Kentucky. You can follow Eyvonne on Twitter, LinkedIn, her blog, and on Network Collective. IT is the only field I’ve ever known. My first job was a high-school internship where I worked for a small mechanical engineering firm. I cleaned, filed papers, delivered parts, and learned about their LANTastic network and the DOS operating system in my spare time. They were looking for a student to mentor and I was the fortunate recipient of their efforts. I started college as a chemistry major but quickly shifted my focus to computer science. I learned a little Linux and begged a job at a mom-and-pop ISP in my hometown. 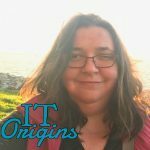 I dabbled in web development then moved to a local SMB VAR where I continued to write PHP, build LAMP stacks, and learn Windows server administration, Exchange and networking. After several years, I landed a role focused on networking in a large enterprise. All told, I’ve been working in IT for over 20 years. In the last five years, I’ve been writing, speaking, and becoming involved in the larger networking community online. Jordan Martin, Phil Gervasi, and I have started Network Collective, a video roundtable podcast where we discuss topics relevant to the day-to-day network engineer. My community involvement has been as rewarding as any work I’ve done at the day job. The ubiquity of technology is the biggest change I’ve seen. I got my first cell phone in college. At the time, I’d only seen a web browser at the college library and the Internet had yet to be commercialized. Now, everyone carries a powerful computer in their pocket. The expectations of end users and the business are higher and IT organizations are struggling to transform to meet their demands. The tendency for IT organizations to rely too heavily on vendors. Strong partner relationships with vendors are important, but at some point, your IT organization has to know what it’s trying to accomplish and to ask hard questions of vendors. Most engineers I talk with believe their organizations rely on vendor promises too much and do not trust the direction of their people. The other side of this coin is that most IT people don’t educate themselves well enough on the business and cannot communicate effectively with the business in terms they understand. A groundswell of new technology is forcing change inside of enterprise IT. The cloud has proven that services can be delivered more quickly and it’s forcing IT organizations to re-evaluate how they operate. We’re starting to see more competition in territories that have long been dominated by single vendors. I’m excited to see where technologies like SD-WAN, whitebox switching, Linux-based network operating systems, and maturing automation tools will take the industry. I use a few common tools, Evernote, ToDoist, LucidChart, and Sublime Text for my personal tech projects. MindNode is indispensable for planning talks or any thought process that is non linear. I’ve found that taking notes in an old fashioned notebook helps clarify my thinking and keep me focused. Regarding this last title, I’m coming to see that most of the problems facing IT are not pure technology problems, they’re people and organizational problems. When our organizations are structured properly, and our teams function well, we can solve the technology problems. An Apple IIe, with 2 x 5 1/4” floppy drives and a color dot matrix printer. (We didn’t spring for the new-fangled device called a mouse). I have 4 kids, ranging in age from 18 to 3 years so they keep me pretty busy. I write, I read, and occasionally play flute. Kevin Myers and Ivan Pepelnjak. “Put your pride in your pocket and get on with solving the problem.” After that, it would be Kevin Myers recommendation to always think of yourself as a company of one.